Celebrity Sightings, 1908 – Tell my story. The date? March 3, 1908, the day after Mardi Gras. The occasion/connection? Good question. This is another oddball jigsaw puzzle in the life of Emmett Wilson that I like to work out. The connection between Emmett and William Bloxham (“Billy”) Crawford is immediately obvious. Emmett and Billy were college friends, roommates and classmates at West Florida Seminary (now Florida State University) and at Stetson University’s law school. “He failed utterly.” This is something Crawford would have published about Emmett for fun! Source: The Stetson Weekly Collegiate, Dec. 5, 1903. Because Crawford was in the publishing business, it would make sense that he would meet, wine, and dine other professional and prominent writers who visited Pensacola. 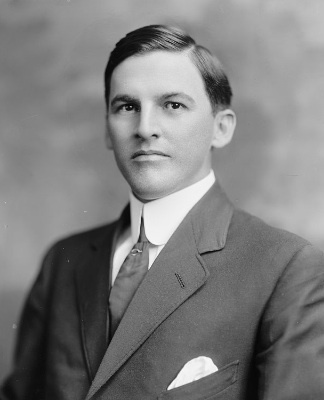 Crawford was prominent, not only in local social and professional circles, but also in political circles, as the son of H. Clay Crawford, Florida’s Secretary of State from 1902 to 1929. Young Billy had three things Emmett coveted all his life: Connections, access, and entree. True, Emmett hung out with Billy because it improved his ‘face value’ in Pensacola society, but it was also true that Emmett and Billy were honest-to-God friends. Evelyn Harris was a son of the author Joel Chandler Harris, of Uncle Remus fame. On March 3, 1908, Evelyn was a marketing and advertising executive with the Southern Bell Telephone company in Atlanta. Evelyn Harris did not have a distinguished literary career as did his father, although he wrote a booklet titled, “A Little Story about my mother, Esther LaRose Harris” in 1949. (It is in the archive at Georgia State University and Agnes Scott College.) The story behind that 65-page booklet is that Harris wrote it for his grand nieces and nephews — he and his wife Annie Louise Hawkins Harris never had children. As facilitator of this fancy men’s dinner, I could see Billy Crawford putting Foster and Joel Chandler Harris’ son together; the senior Harris had recently launched a popular magazine, Uncle Remus’ Home Magazine, and perhaps Evelyn Harris shared interesting anecdotes about his father’s career. Alas, it would have been unlikely that Joel Chandler Harris himself would have attended this dinner: He was in poor health due to acute nephritis and complications from cirrhosis — alcoholism. He died exactly four months later, on July 3, 1908. The date on the article about the dinner is important. The day before, March 2, 1908, Emmett was a gentleman-in-waiting in Pensacola’s Mardi Gras court. This was a huge society coup for the women mostly, but in truth, anyone who was invited to serve in the royal court of, basically, the most important social event of the year had made it, socially and politically. By now, Emmett’s political and social star was on the rise. But the dinner article doesn’t state when the event took place. Likely it wasn’t on March 2; Emmett would have been too busy in the day-and-night-long social activities to attend a fancy dinner with a famous playwright and author. Foster is in Pensacola as of January 19. The Rev. Whaley was pastor of Christ Episcopal Church, which was Emmett’s church. Foster was on a lengthy visit in Pensacola. Evelyn Harris is in Pensacola as of March 1 — because he didn’t work for himself, as Foster did per se, likely he wasn’t in Pensacola on a lengthy visit. Perhaps the dinner took place on March 1 or March 2. Source: ChroniclingAmerica.gov. Pingback: “The Hardest Ride a Man Can Take” – Tell my story.